The Daniel Marshall 35th Anniversary Collector’s Edition is made of Macassar Ebony wood from Sri Lanka, the same material Marshall used on the humidor that he originally made for Alfred Dunhill of London back in 1982. Daniel Marshall has been crafting world-class humidors since 1982 inside his workshop in sunny Santa Ana, California. To commemorate his 35th year in business, Marshall has launched a limited-edition humidor inspired by the very first humidor he ever constructed. “Blowing off two decades of dust and being reunited with this precious humidor—and to see the work I did 35 years ago—to a build a humidor still functional and beautiful was one of the greatest feelings,” said Marshall. The find inspired Marshall to recreate the humidor. The Daniel Marshall 35th Anniversary Collector’s Edition is made of Macassar Ebony wood from Sri Lanka, the same material Marshall used on the humidor that he originally made for Alfred Dunhill of London back in 1982. That humidor prototype, which Marshall thought he had lost, was recently discovered hidden deep in the archives of his shop. The 35th Anniversary humidor, which retails for $1,995, is limited to 100 pieces, each signed and dated by Marshall. 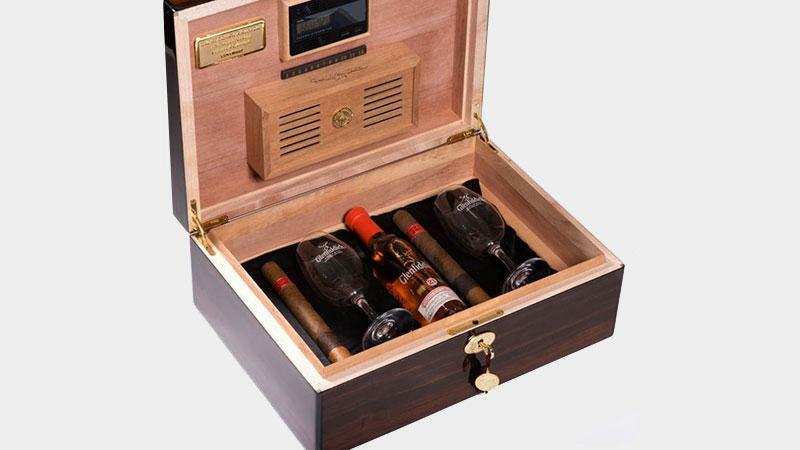 The humidor holds approximately 125 cigars and features a gold plate affixed under the lid engraved with its limited-edition number. Each humidor also houses a small bottle of Glenfiddich 21 Reserva Rum Cask Finish that is signed by Kristen Grant, the great-granddaughter of William Grant, who founded the Glenfiddich Distillery in 1886. To complement the whisky, two Glenfiddich-branded whisky tasting glasses from Scotland are included as well as 15 cigars from Marshall. Inside will be five DM Red Label Tasting cigars that are distinguished by the three different types of wrapper leaf (Ecuador, Pennsylvania and Indonesia) that cover the Nicaraguan binder and filler. Marshall created the tiered-looking smoke specifically to pair with Glenfiddich whiskies. Alongside those cigars are 10 DM Red Label Churchills, a Nicaraguan puro. Marshall will be hosting a 35th anniversary celebration at the Daniel Marshall Cigar Lounge at the Kitzbuhel Country Club in Austria on January 20.